India, China Top List Of Nations With Most Slaves : Parallels But the country with the highest prevalence of modern-day slavery is Mauritania. That's according to a report released Thursday by the Walk Free Foundation, an anti-slavery group. The numbers are in line with previous estimates from the U.N. and the State Department. 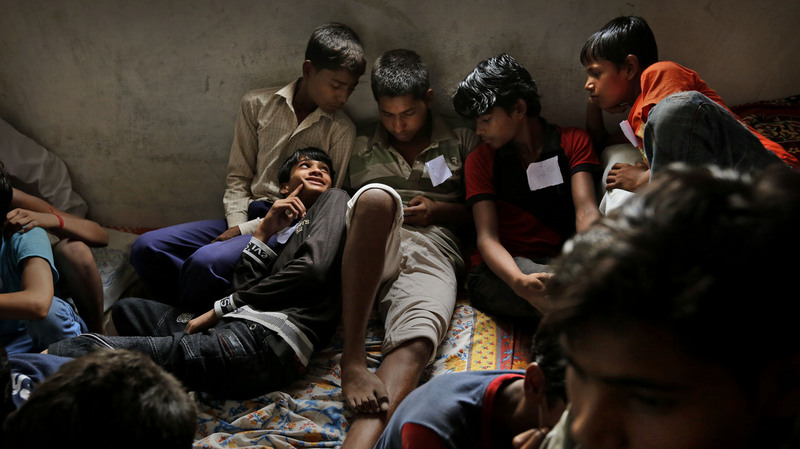 Child laborers wait to be processed at a safe house after being rescued during a raid at a factory in New Delhi by workers from Bachpan Bachao Andolan (Save the Childhood Movement) in June. Nearly 30 million people live in slavery worldwide, with most of them in Asia and Africa, according to a report released Thursday. The Walk Free Foundation's ranking incorporates factors that include the traditional definition of slavery — owning another person — as well as things such as child marriage and human trafficking. -- India, China, Pakistan, Nigeria, Ethiopia, Russia, Thailand, Democratic Republic of Congo, Myanmar and Bangladesh together account for more than three-quarters of the total estimate. -- The West African nation of Mauritania tops the list. It has the highest estimated proportion of enslaved people in the world. The report says there are between 140,000 and 160,000 people enslaved in Mauritania. That's out of a population of just 3.8 million. -- India has the most slaves (between 13.3 million and 14.7 million people), followed by China (2.8 million to 3.1 million) and Pakistan (2 million to 2.2 million). -- Iceland, Ireland and the U.K. have the fewest slaves. (They rank 160 on the index.) The U.S. is ranked 134 (with between 57,000 and 63,000 people considered enslaved). Kevin Bales, the report's lead author, tells NPR's Audie Cornish that the exploitation of people seeking opportunity — in other words, economic migrants — is getting worse. The Walk Free Foundation's numbers are higher than estimates of forced labor issued by the U.N.'s International Labor Organization and from the U.S. State Department. Bales tells Audie that's because this new report uses "better, more advanced methodology." We reported earlier this year on the State Department's list of countries it believes aren't doing enough to combat modern-day slavery. They included Russia, China and Uzbekistan. But the report also focused on everyday sectors that depend on trafficking victims. Bales says that slavery today can be found in work that is "dirty, dangerous and demeaning," such as mining, agriculture and fishing. An ILO report last month cited the Thai fishing industry, among the world's largest, for "deceptive and coercive labor practices, and even forced labor and human trafficking."